Many of the world’s great religious traditions urge us to be mindful, to focus on the present moment, and to fill our hearts with gratitude. It is this charge, to take things “one step at a time,” that drives the mission of the Grateful Steps Foundation. We have a Christian philosophy but we are not a religious publisher. We are here to help others tell their stories, rather than get other people to live ours. Authors include the poet T.A. 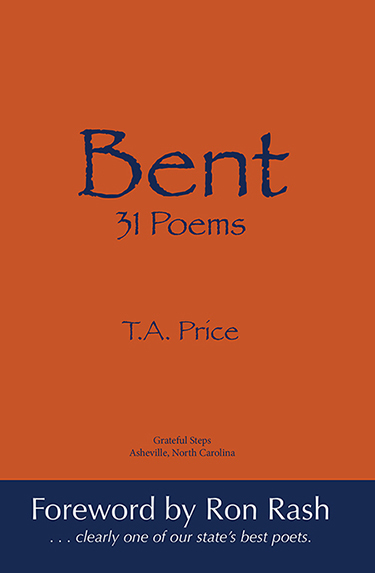 Price (31 Bent Poems); novelist Barbara Willis Kimbrell (Drunks, Monks, and Mental Illness); and equine expert Catherine Hunter (Sacred Connections: Horsemanship). Grateful Steps not only wants to publish great books, they want to publish books that further the causes of other worthy non-profit organizations; expand the interfaith conversation in western North Carolina; and support economic development and social enterprise. As part of that mission, each month they feature a different visual artist’s collection in their space. Their on-site store emphasizes local authors and niche genres. Donations of $5 or more are welcome here. Printing costs are often off-set by donations. While a book’s saleability is not their primary concern, according to a 2014 write-up in Mountain Xpress, Grateful Steps does have the occasional runaway hit. Over the past nearly fourteen years, they’ve been written up in Publisher’s Weekly, Mountain Xpress, the Asheville Citizen-Times, and elsewhere. There’s no real information on the website in terms of how to submit to Grateful Steps, but if you sign up for their newsletter you’ll be the first to know when their short story contest opens and be able to keep up to date with all their goings on. You can also visit their website, www.gratefulsteps.org, or follow them on Facebook and Twitter. This was written by charles. Posted on Thursday, March 29, 2018, at 10:32 am. Filed under Uncategorized. Tagged barbara willis kimbrell, cahterine hunter, grateful steps, nc publishers, small press, t.a. price, western nc. Bookmark the permalink. Follow comments here with the RSS feed. Both comments and trackbacks are currently closed.